. ■ • j . FIGURE 7 Representative mammographic images with a single biopsy-proven MCC showing (a) a 512 x 512 pixel original digitized image, (b) enhanced image using the hybrid filter (Fig. 1), (c) enhanced image using the hybrid filter without the AMNF stage, (d) the enhanced image using the TSF for noise suppression, (e) NN detection results for the original image as input, and (f) NN detection results using the enhanced image as input. Several FN detections were observed in the results (e) obtained with the original image as the input. 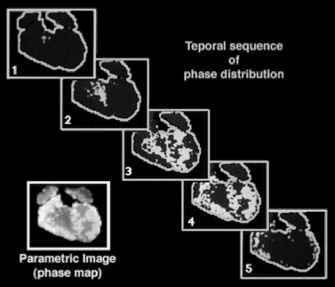 enhanced MCCs and films demonstrated good correlation in terms of the number of calcifications, as well as their shape and distribution. FIGURE 6 Representative mammographic images with a single biopsy proven mass showing (a) the original digitized image, (b) enhanced image using the hybrid filter (Fig. 1) with a two-channel multi-resolution WT, (c) enhanced image using the hybrid filter with a four-channel multiresolution WT. extracted from both the unprocessed and enhanced versions of the images. One ROI type contained a representative MCC and the other ROI type contained normal parenchymal tissue. Testing was performed on all the 100 single view mammograms in database (a), using first the original versions and then the enhanced outputs. When the output of the NN, within a moving window, was more than a given empirically derived threshold, the output was identified as an individual microcalcification and labeled as a square on the image [4,18]. Representative results of NN detection of MCCs are shown in Fig. 7e and Fig. 7f. Significant improvement in the network's performance was observed when the enhanced images were used as inputs. For example, in Fig. 7f, the NN detected most of the microcalcifications within the cluster using the enhanced image, but only some of them were detected using the original image, as shown in Fig. 7e. Because of these false negative (FN) detections in the results with the original image, the extent of the MCC is not properly delineated. Analysis of the 100 full images further demonstrated the importance of the enhancement step and 93% sensitivity was observed in the detection of MCCs with less than 1.35 FP MCCs/image using the enhanced images. With the original images as inputs, however, a lower sensitivity of 71% was observed for approximately the same FP detection rate (1.47 FP clusters/image). An illustration of the potential performance of the filter is shown in Fig. 8 for texture enhancement of a representative normal digital chest image, contrast enhancement for skin tumor imaging, and nerve fiber bundle detection in retinal imaging using a visible-light camera. In all cases, improvement in image texture or detail is apparent in the enhanced image as compared to the original image. Optimal linear gray-scale mapping was used in each instance for purposes ofcomparison. 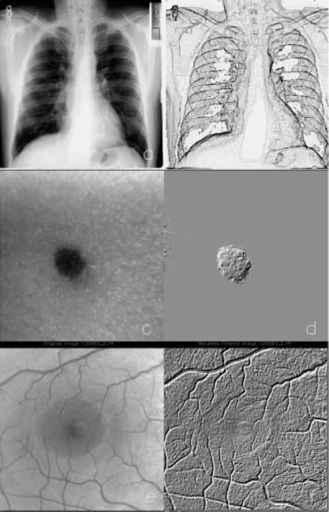 FIGURE 8 Representative original and enhanced image pairs using the hybrid filter in different applications (a) and (b), normal chest image showing texture enhancement, (c) and (d), skin tumor image, and (e) and (f), retinal image. the variability among four radiologists was reduced when the enhanced images were used to assist the interpretation of the original softcopy image data on the monitors . Several methods may be used to improve the hybrid filter. First, the use of more than four channels in the WT would provide a greater number of decomposed subimages. More selective reconstruction of subimages may allow better preservation of image detail and possibly better removal of structured image noise. Second, the hybrid filter could include the use of adaptive wavelet methods, similar to those proposed for image compression . In the adaptive method, a group of orthogonal bases are iteratively computed to minimize the object function for a specific task such as image enhancement. Universal wavelet algorithms can be developed for image enhancement, segmentation, detection, and compression in medical image processing. 1. I. Pitas and A. N. Venetsanopoulos, "Nonlinear digital filters: Principles and applications," Kluwer Academic Publishers, Norwell, MA 1990. 2. W. Zhang, K. Doi, M. L. Giger, R. M. Nishikawa, and R. A. Schmidt, "An improved shift-invariant artificial neural network for computerized detection of clustered microcalcification in digital mammograms," Med. Phys. 23, 595-601, Apr. 1996. 3. N. Petrick, H. P. Chan, D. Wei, B. Sahiner, M. A. Helvie, and D. D. Adler, "Automated detection of breast masses on mammograms using adaptive contrast enhancement and texture classification," Med. Phys. 23(10), 1685-1696, Oct. 1996. 4. B. Zheng, W. Qian, and L. P. Clarke, "Digital mammo-graphy mixed feature neural network with spectral entropy decision for detection of microcalcifications," IEEE Trans Med. Imag. 15, 589-597, Oct. 1996. 5. W. Qian, L. P. Clarke, D. Song, and R. A. Clark, "Digital mammography: Hybrid 4-channel wavelet transform for microcalcification segmentation," Acad. Radiol. 5: 354364 1998. 6. W. Qian, M. Kallergi, and L. P. Clarke, "Order statistic-neural network hybrid filters for gamma camera image restoration," IEEE Trans. Med. Imag., 56-65, March 1993. 7. W. Qian, L. Li, and L. Clarke, "Image feature extraction for mass detection using digital mammography: Influence of wavelet analysis," Med. Phys. 26(3), 402-408, March 1999. 8. W. Qian, L. P. Clarke, M. Kallergi, and R. A. Clark, "Tree-structured nonlinear filters in digital mammography," IEEE Trans. Med. Imag. 13(1), 25-36, 1994. 9. W. Qian, L. P. Clarke, H. D.. Li, M. Kallergi, and R. A. Clark, "Digital mammography M-channel quadrature mirror filters for microcalcification extraction," Comp. Imag. Graph. 18(5), 301-314, Sept./Oct. 1994. 10. W. Qian, M. Kallergi, L. P. Clarke, H. D. Li, R. A. Clark, and M. L. Silbiger, "Tree-structured nonlinear filter and wavelet transform for microcalcification segmentation in digital mammography," Med. Phys., vol. 22(8), 12471254, 1995. Mammography," Invited Paper, IEEE Eng. Med. Biol. Mag., 14(5), 561-569, 1995. 12. W. Qian and L. P. Clarke, "Hybrid M-channel wavelet transform methods: Adaptive, automatic and digital X-ray sensor independent," Med. Phys. 22(6), 983-984, 1995. 13. W. Qian, L. P. Clarke, "Wavelet-based neural network with fuzzy-logic adaptivity for nuclear image restoration," Invited Paper, Proc. IEEE, Special Issue on Applications of Neural Networks 84(10), 1996. 14. W. Qian, L. Li and L. P. Clarke, "Hybrid adaptive wavelet-based CAD method for mass detection," Proc. SPIE Med. Imag., 790-794, 1997. 15. M. Kallergi, L. P. Clarke, W. Qian, M. Gavrielides, and R. A. Clark, "Interpretation of calcifications in screen/film, digitized, and wavelet-enhanced monitor-displayed mam-mograms. A receiver operating characteristic study," Acad. Radiol. 3, 285-293, 1996. 16. L. Li, W. Qian, and L. P. Clarke, "Digital mammography CAD method for mass detection using multiresolution and multiorientation wavelet transforms," Acad. Radiol., 724731, 1997. 17. W. Qian, L. Li, L. Clarke, and R. A Clark, "Digital mammography: Comparison of adaptive and non-adaptive CAD methods for mass detection," Acad. Radiol., August 1999. 18. F. Mao, Y. Zhang, D. Song, W. Qian, and L. P. Clarke, "An improved method of individual area grouping for microcalcification detection in digital mammograms," Proceedings — 20th Annual International Conference — IEEE/EMBS Oct. 29-Nov. 1, 1998, Hong Kong, pp. 740743. 19. Z. Yang, M. Kallergi, M. R. DeVore, R. J. Lucier, N. W. Qian, R. A. Clark, and L. P. Clarke, "Digital mammogram compression with standard, hyperbolic, and adaptive wavelets," IEEE Eng. Med. Biol. Mag. 14(5), 570-577, Sept./Oct. 1995. 20. L. S. Davis, "A survey of edge detection techniques," Comp. Graph. Image Proc. 4, 248-270, 1975. 21. G. S. Robinson, "Edge detection by compass gradient masks," Comput. Graphics Image Proc. 6, 492-501, 1977. 22. W. Frei and C. C. Chen. "Fast boundary detection. A generalization and a new algorithm," IEEE Trans. Comp. 26(2), 988-998, Oct. 1977.